"One of my goals in the book is to try to get people to think differently — that we don’t have to have perpetual war, that maybe mankind can progress away from engaging in so much warfare." 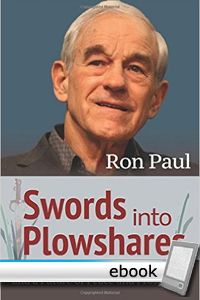 Renowned champion of liberty Ron Paul gets personal in this book, reflecting on his experiences growing up during World War II. The book also provides a powerful critique of the moral debasement and economic distortion of a 20th century rife with militarism, imperialism, destruction, and bloodshed. Ever the optimist, however, Paul closes with a stirring, inspiring view of a future that is ours for the taking, if we would only turn way from war and empire. When people read Swords into Plowshares generations from now – and they will – they will marvel that such a man actually served in the US Congress, and defied every campaign of war propaganda right on the House floor. But what’s great about Ron is not just his honesty, but also his constant intellectual growth – with the passage of time he has become an ever-more radical champion of freedom. His evolution is especially plain in this book, as you’ll discover for yourself. Read Lew's full review of Swords into Plowshares here.